If you decide to do GSM termination in Macedonia, you need to connect the high-speed Internet to ensure the normal operation of VoIP equipment. Today, broadband Internet in the country is available to most local residents as the penetration rate is 70.8%. It is possible to connect via cable, fiber, and satellite technology. Nevertheless, in order to obtain high profits, the cost of the Internet should be minimal. In Macedonia, the market of Internet services is well developed. In the sector, there is a high competition. Therefore, the price policy is rather democratic. 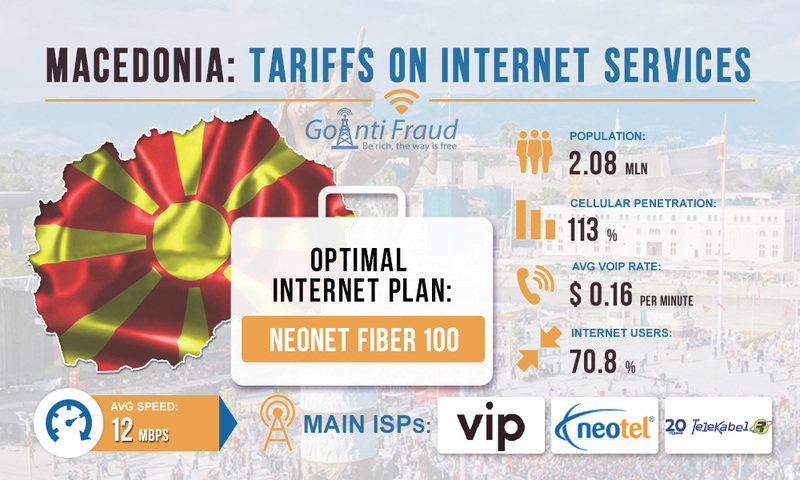 The main providers of Macedonia are VipNet, NeoTel, and TeleKabel. Consider what tariffs each of them offers for their services. VipNet S (cable technology). Unlimited access. The subscription fee is $12 a month; speed is up to 30 Mbps. VipNet M (cable technology). Unlimited access. The subscription fee is $18 a month; speed is up to 100 Mbps. VipNet Lite (ADSL). Unlimited access. The subscription fee is $12 dollars a month; speed is up to 10 Mbps. NeoNet Fiber 50. The speed is up to 50 Mbps. The first 3 months, the subscription fee is $11 and $22 dollars a month after. NeoNet Fiber 100. The speed is up to 100 Mbps. The first 3 months the subscription fee is $18 dollars, after that, it is $35 a month. Lightspeed. Unlimited access at speed of up to 15 Mbps. The subscription is $10 a month. Warpspeed. Unlimited access at speed of up to 25 Mbps. The subscription is $ 29 a month. Hyperspace. Unlimited access at speed of up to 150 Mbps. The subscription is $48 a month. Optic 40. Unlimited access at speed up to 40 Mbps, the subscription fee is $19 a month. Optic 100. Unlimited access at speed of up to 100 Mbps, the subscription fee is $48 a month. Optic 1000. Unlimited access at speed of up to 1 Gbps, the subscription fee is $67 a month. As you can see, in Macedonia, there is an opportunity to connect high-speed Internet at minimal prices. For effective operation of the GSM gateway SIM bank, we recommend using a fiber-optic Internet connection. The optimal Internet plan is NeoNet Fiber 100 from NeoTel. You will get access to the Internet at a speed of up to 100 Mbps for $35 a month. This will allow you to work even with multichannel equipment, with minimal business expenses on the Internet.